Sustainable procurement is the adoption and integration of Corporate Social Responsibility (CSR) principles into your procurement processes and decisions while also ensuring, they meet the requirements of your company and its stakeholders. Sustainable Procurement integrates requirements, specifications and criteria that are compatible with the protection of the environment and the society. It is not simply about not using child labor or illegal chemicals that can damage the environment and peoples’ health. Commitment in sustainable procurement ensures values which are core to the business are integrated through a company’s supply chain into the life cycle of the company’s products and services. Best practice would be to future proof your company’s sustainable procurement and investments with sustainable policies in order to increase the viability for the long term. 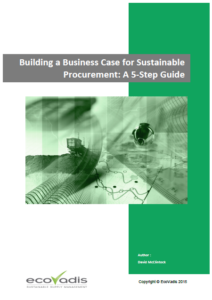 If you would like to learn more on how to build a business case of sustainable procurement, please download our 5-Step Guide. Policies and strategies for sustainable procurement developed by companies are based on the need to future proof themselves primarily around scarcity in supply and ability to cope with the demand of emerging markets, pressures brought upon by cost and ability to reduce this through reductions in energy consumption and waste reduction. Also the need to protect brand reputation, taking sustainability in procurement seriously demands risk management and addressing of weakness areas that could bring about scandals and bad publicity. Lastly, differentiation of their brand with the view of procuring sustainably for creation of opportunities that entail developing services & products that are more innovative and sustainable that are also relevant to their markets and customers. Cost Reduction: Reduction in total cost of ownership linked to reduced energy costs, reduced over-speciﬁ cation, reduced consumption and reduced social and environmental compliance costs. Revenue Growth: Additional revenue through innovation of eco-friendly products/services, price premium or income from recycling programmes. Tip: Examples of these can be found in this paper on “The Value of Sustainable Procurement Practices” by INSEAD and EcoVadis. Want to know more about sustainable procurement in detail and how EcoVadis helps companies with its practices and challenges?